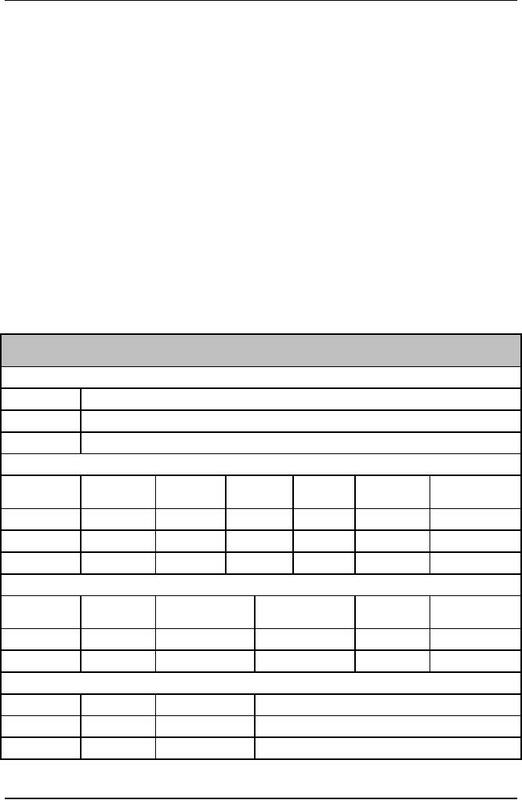 displays a plan consisting of the start and end dates of each task. extension of tasks across days along with the corresponding resources. focus on micro level units. 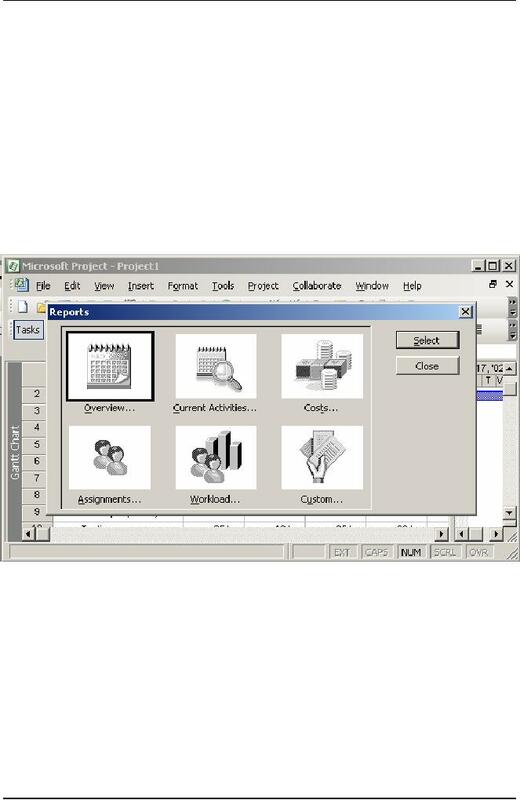 Microsoft Project enables you to perform these tasks. is an activity that has a defined start and end dates. project in five phases: analysis, design, development, testing, and implementation. create tasks for each phase, specify their duration, and assign resources to them. 1. Click the Project menu. 11.1 displays the Project menu. 2. Click the Task information command on the Project menu. details of the task being created. create a general task. The other tabs have specific purposes for each task. tab. For the same task, you can use the Notes tab to add notes. box by using the Shift and F2 shortcut key combination. 3. Type Analysis in the Name text box. 4. Specify the duration of the Analysis task as 5d in the Duration text box. Estimated check box next to the Duration text box. 5. Click OK to confirm the details provided by you. summary task is the finish date of the last subtask under the summary task. You need to create this task below the Analysis task. 2. Select the Project scope determination task. 3. Click the Indent icon on the Formatting toolbar. indent icon to make the Analysis task as a summary task. Similarly, you create the rest of the tasks listed in the project plan of XYZ Inc.
file with an extension .mpp in Microsoft Project. project startup, project end, pilot implemented, and SRS document sign off. milestone in the Task Information dialog box. 1. Click the Advanced tab in the Task information dialog box. milestone tasks. It also contains options to specify constraints and deadlines. 2. Type Analysis Complete in the Name text box. 3. Select the Mark task as milestone check box. You do this to specify a task as a milestone task. 4. Click OK to close the Task Information dialog box. 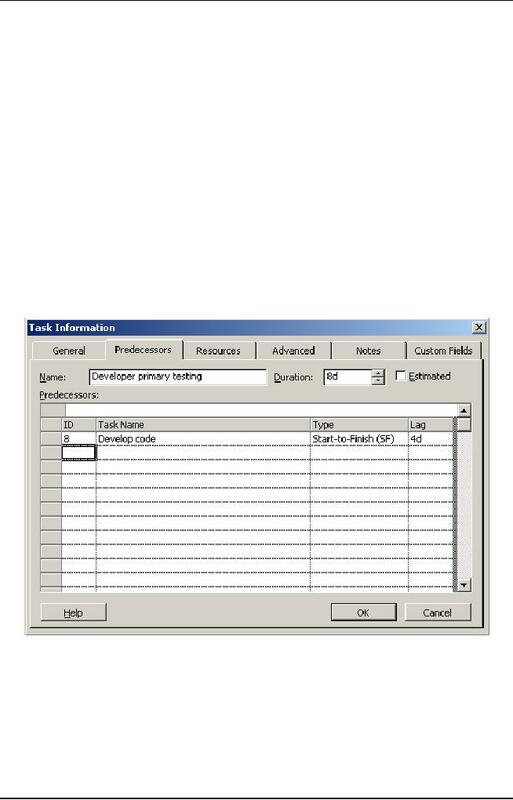 Figure 11.5 displays the Mark task as milestone check box selected. chart view. Similarly, you create other milestone tasks in the Project file. example, a weekly project meeting with all the team members is a recurring task. the task needs to recur. project activities effectively, you can convene a meeting every day. create the recurring task you perform the following steps. 1. Select the task row where you want the task to appear. 2. Click the Insert menu. 4. Type Project meeting in the Name text box. button is selected by default. 6. Click the End by option button. 7. Select February 14 from the calendar. 8. 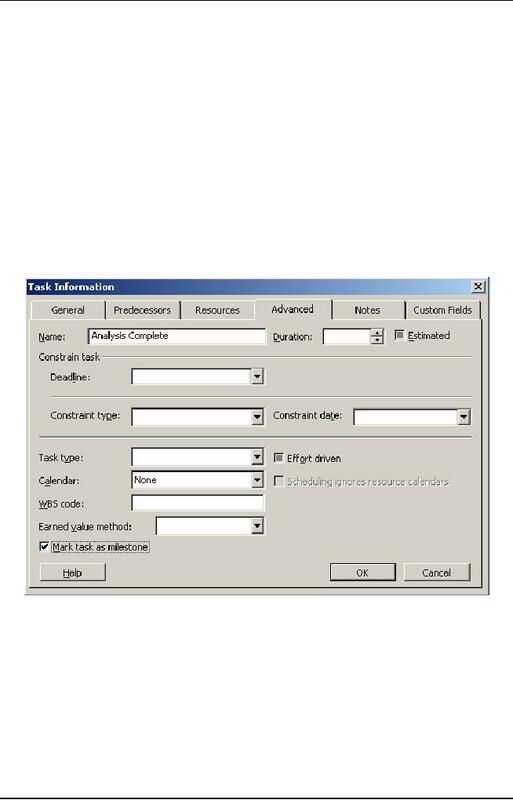 Click OK to close the Recurring Task Information dialog box. until the last date specified. the goals and features of the project if you decide to reduce the project duration. Therefore, it is important that you decide the tradeoff judiciously. 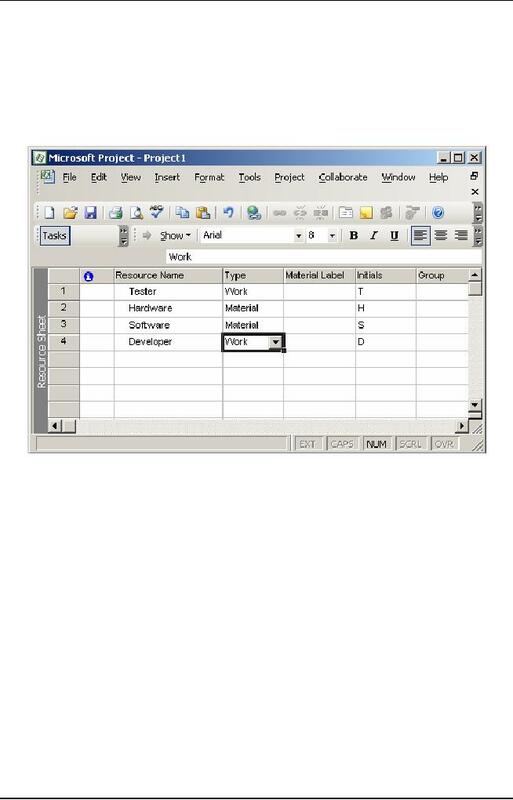 are available in Microsoft Project. as possible. For this reason you do not mention a specific date for such a task. constraint, you can assign a specific start date to it. as possible. This is the reason why no specific date is mentioned for such a task. constraint, you can assign a specific finish date to it. before the analysis phase, which is scheduled to start from February 20. This constraint enables you to schedule the start date of a task as early as possible. create test cases is dependent upon the construction and the unit testing phases. this start date but not before. able to finish the unit-testing task before the specified date. projects depending upon client requirements. appreciate if the task finishes before that. 2. Type Develop test plans in the Name text box of the Advanced tabbed page. 4. Click the Constraint type box. 5. Select the Finish No Later Than option in the displayed list. 6. Click the Constraint date list. 7. Select August l0 as the finish date from the calendar that is displayed. Figure 9.7 displays this step. 8. Click OK to close the Task Information dialog box. 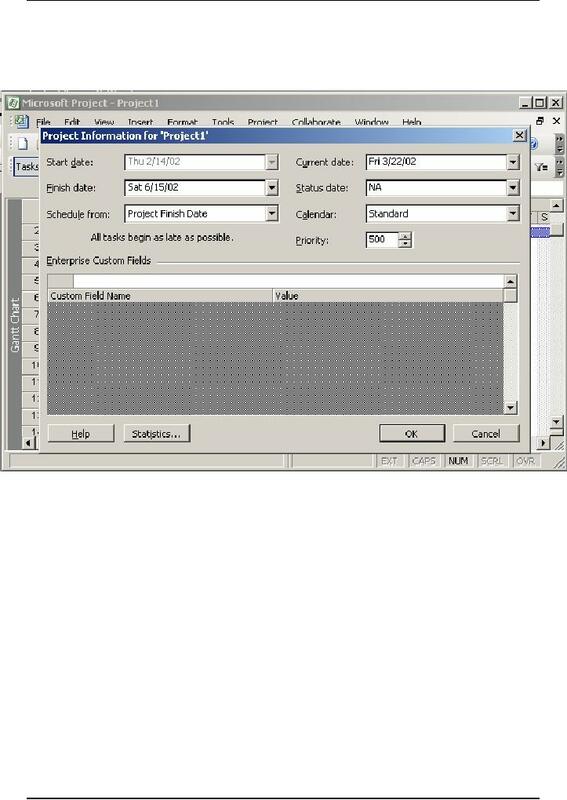 constraint in the Task sheet of the Gantt chart view. enables you to schedule the subsequent tasks. crossed its deadline with an indication mark next to it. 1. 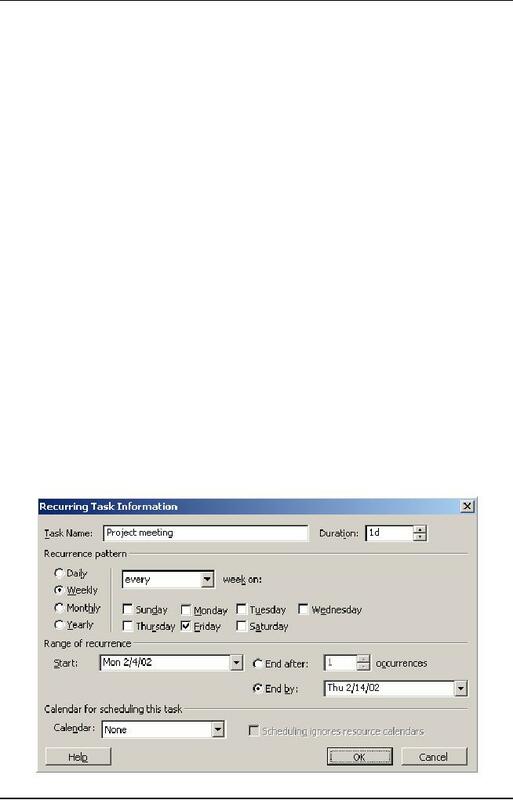 Create the task Assign development staff by using the Project menu. 2. Select the Assign development staff task. This is the task for which you need to set a deadline. 3. Click the Advanced tab in the Task Information dialog box. 4. Click the Deadline list box in the Advanced page. This is done to specify the deadline for the Assign development staff task. 5. Select July 15 in the calendar to specify the deadline date. 6. Click OK to close the Task Information dialog box. Similarly, you can add deadlines for the other tasks for the XYZ Inc. project. document serves as a prerequisite for the immediate subsequent phase. task. FS is the default relationship when you link any two tasks. on each other. Therefore, the link between them is SS. cannot end unless implementation testing for that software product is complete. testing phase can only start after the coding phase is complete. time for the high-level design to start. Predecessors page. This page exists in the Task Information dialog box. 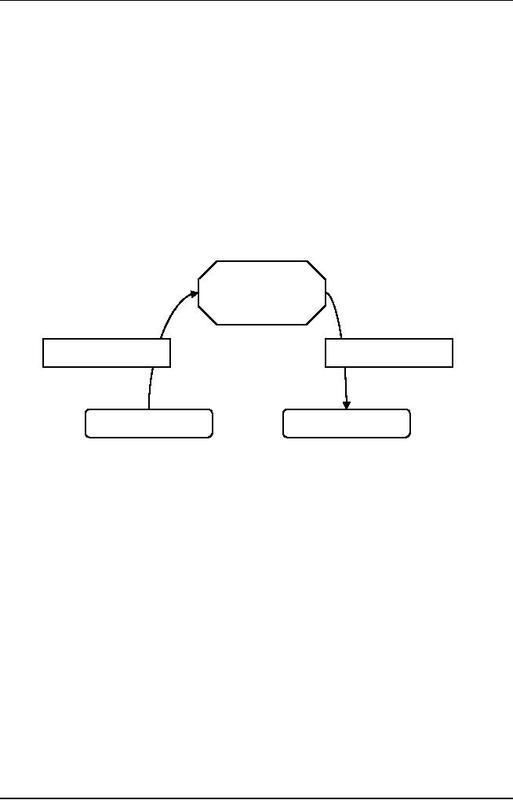 the schedule of a successor task before time. of the Predecessors page. This page exists in the Task Information dialog box. the project plan can only be drafted four days after resources are procured. project, you need to link the Develop code and Developer primary testing tasks. 1. Create a task named Develop code by using the Project menu. by using the Project menu. 4. 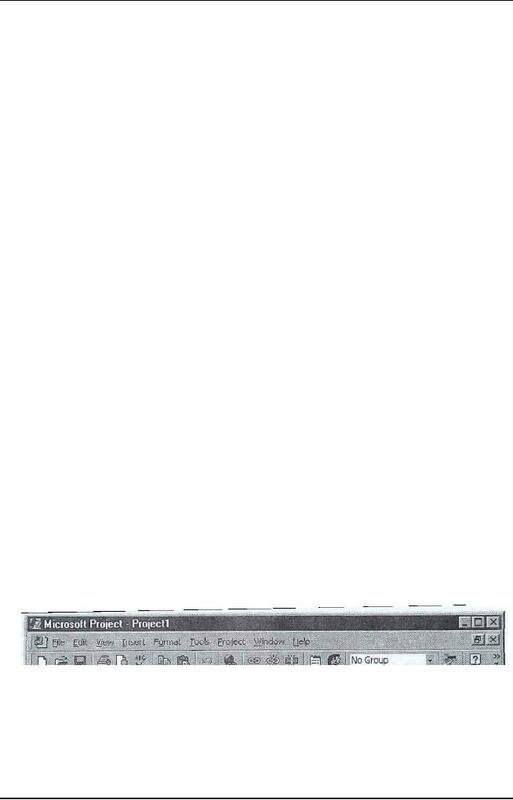 Select Developer primary testing with the Ctrl key pressed. 5. Click the Edit menu. 6. Click the Link Tasks command. the Developer primary testing task and click the Project menu. 8. Click the Task Information command. 9. Click the Predecessors tab in the Task Information dialog box. 10. Select the Start-to-Finish (SF) relationship in the Type field cell. This defines a start-to-finish relationship for the tasks. two tasks. This step is displayed in Figure 11.9. 12. Click OK to close the dialog box. 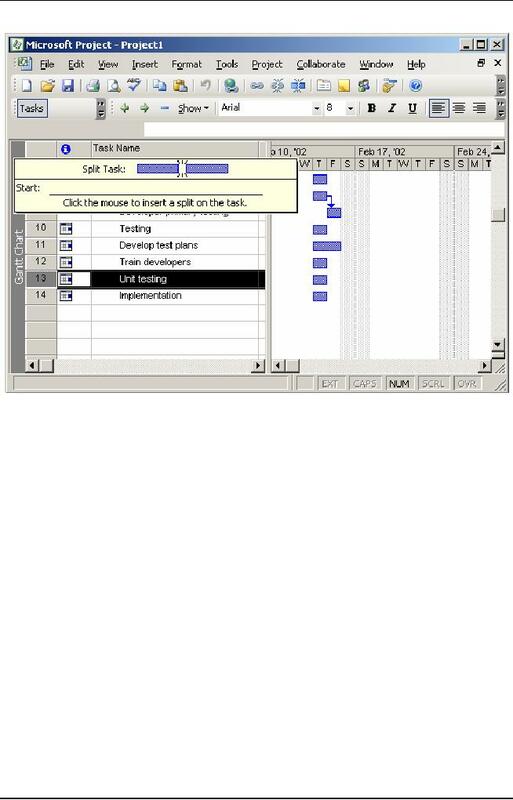 other with the symbol of Start-to-Finish relationship in the Gantt chart view. Testing task. Next, you split the Unit testing task. 1. Create a task named Unit testing below the Testing summary task. 2. Select the Unit testing task. 3. Click the Edit menu. The Edit menu contains the command that enables you to split a task. 4. Click the Split Task command on the Edit menu. 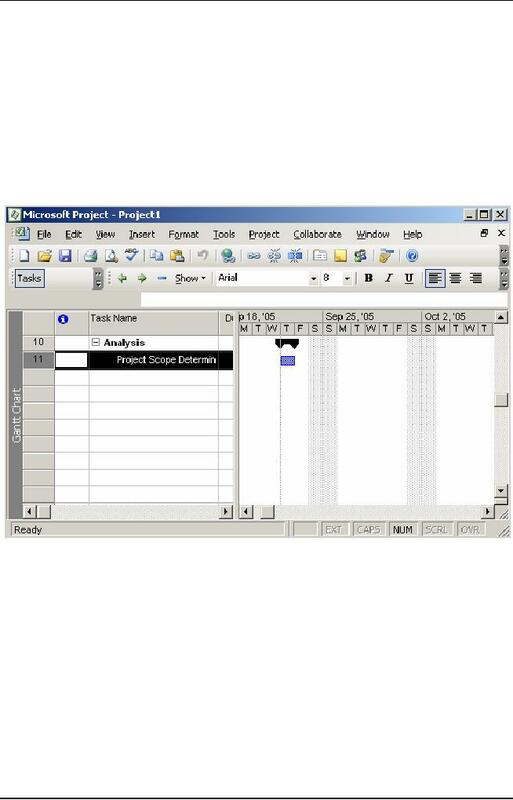 hovers on the task view of the Microsoft Project window. 5. 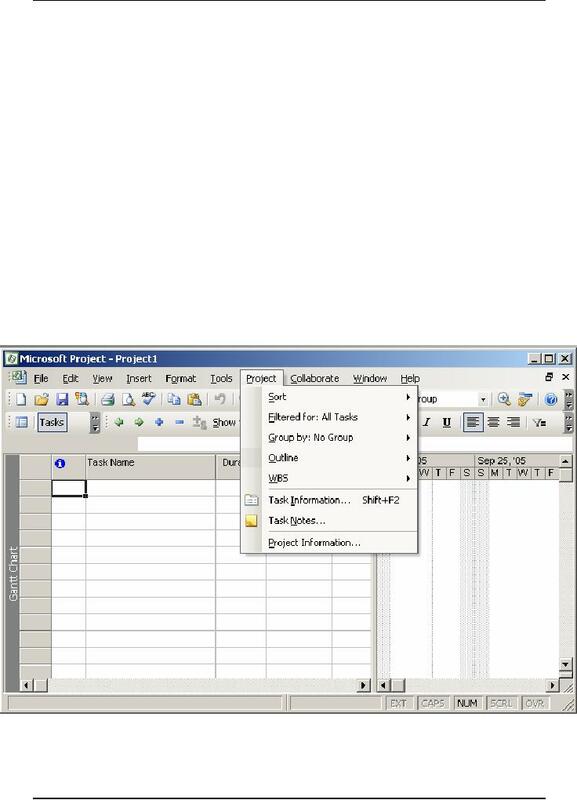 Drag the changed mouse cursor over the task in the Gantt chart view. In Figure 11.10, you can see the task being split into the required number of days. task and release the mouse pointer on May 15 in the Gant Chart view. Resources are means that help convert input to a task into output for the task. people and equipment. At the end of a project, these resources are not consumed. 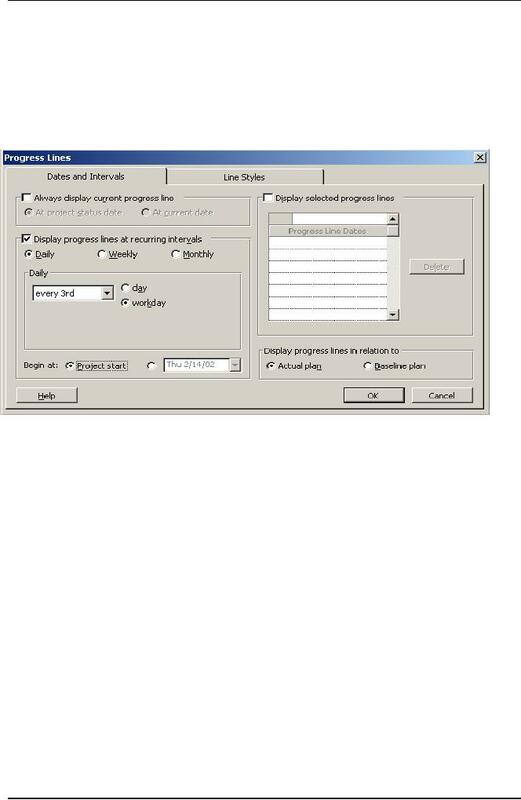 Create a task named Develop prototype below the Analysis summary task. Select the Develop prototype task. The Tools menu contains the command to add a resource. Point to the Resources command. of the Resources command of the Resources submenu is displayed. percentage. However, the unit for material is specified as a numeric value. is added next to the Develop prototype task. the standard and overtime rates. 4. Click the Project menu to display the Resource Information command. 5. Click the Resource Information command on the Project menu. 6. Click the Cost tab in the dialog box. 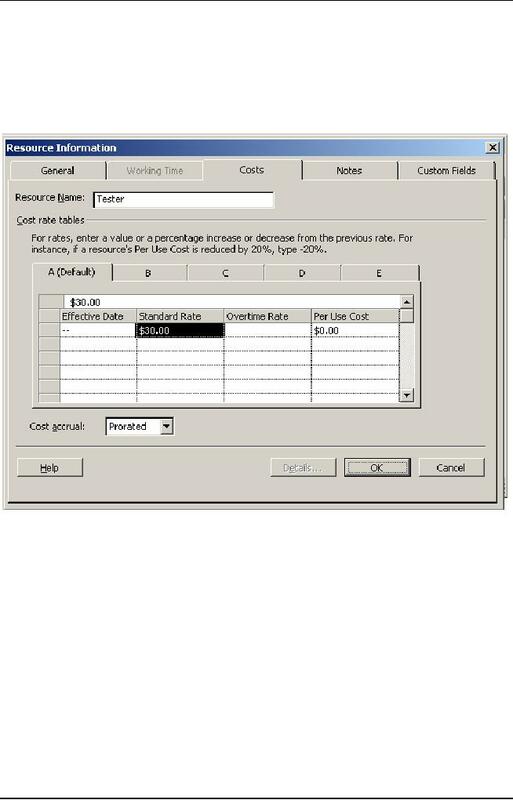 the cost per unit of a particular resource. 8. Type $10.00/h in the first cell of the Overtime Rate column. in rate, such as +20% or -20%. 9. Click OK to close the Resource Information dialog box. by the hourly rates that you specify and the time required for completing a task. you and the quantity of material required for completing the task. also ensures strict adherence to project plans, requirements, and schedules. performance of the project with the baseline that you save. 1. Click the Tools menu, and point to the Tracking command. 2. Select the Save Baseline command on the Tracking submenu. option buttons to save a baseline of the entire project. a task to conduct project plan analysis. be done in the rest of the project cycle. 1. Select the task Unit testing for which you want to view the task completion status. This task exists under the Testing summary task. 2. Click the View menu. 3. Click the Table Entry command. After doing this, four fields appear: Work, Baseline, Actual, and Remaining. You update the Actual field value with the current amount of work done. 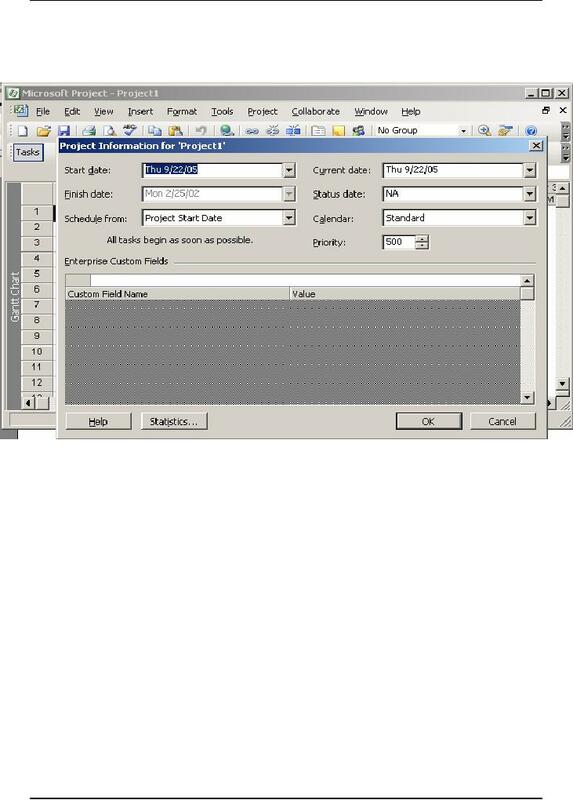 the value 27, and the value in the Variance field is 3.
present in the General tab of the Task Information dialog box. 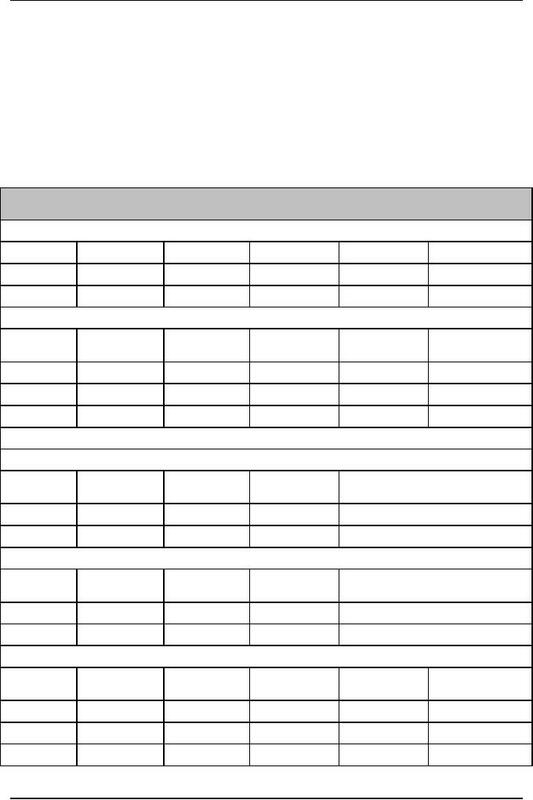 the work sheet of tasks. Create a task named Create user manuals under the Development task. Make the Development task a summary task by using the left indent Icon. 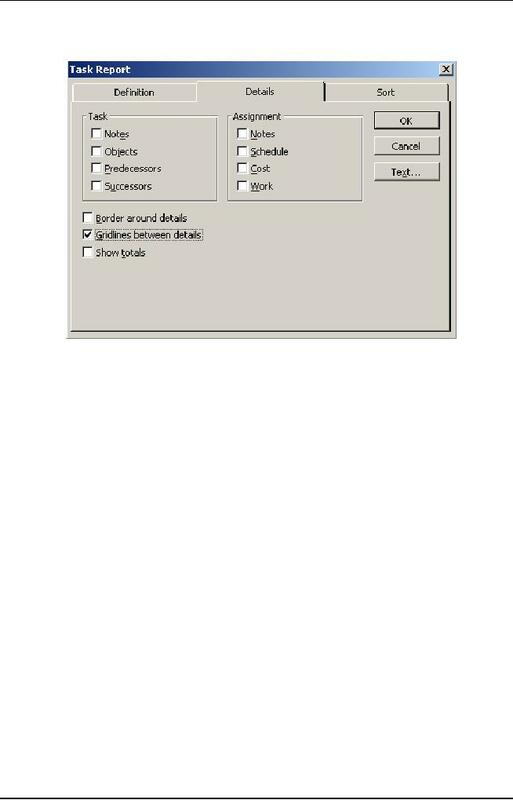 Select the Create user manuals task. Click the Tracking command on the Tools menu. Update Project dialog box. Figure 11.18 displays this dialog box. after option. This option is used to reschedule an incomplete task. Specify a new start date for the Create user manuals task. entire project, choose the Entire project option. 3. In the Project Information dialog box, click the Schedule from list box. 4. 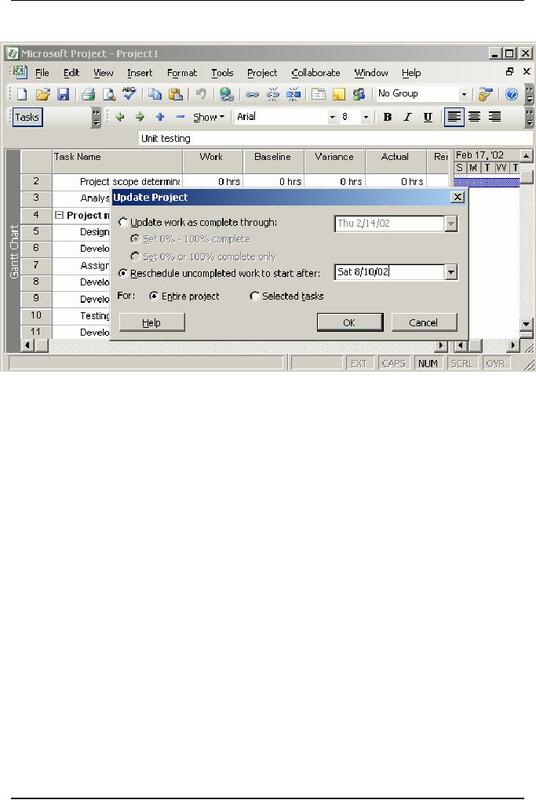 Select the Project Finish Date option from the Schedule from list. June. 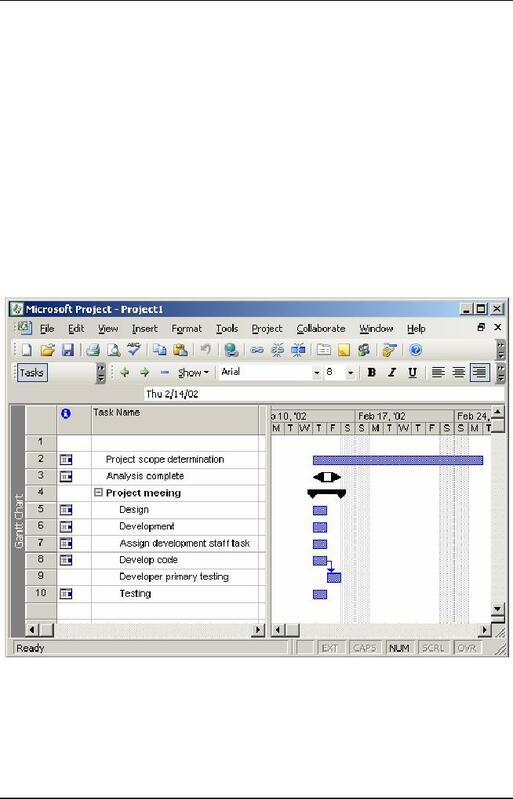 This step is shown in Figure 11.19.
change in the Gantt chart view of the project. prepared for a specific phase or for all the phases at one time. regarding tasks and the duration to complete each task in a project. 6. Click the View menu. 7. Click the Reports command. Figure 11.20 displays the Custom icon. 5. Click the Select button. This displays the Custom Report dialog box. 6. Click the New button. 7. 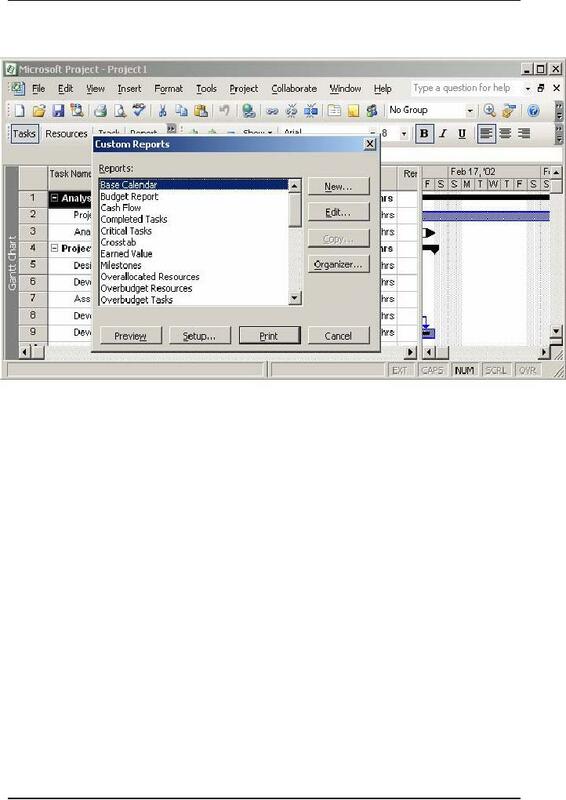 In the Report type box, select the Resource option. 8. Click OK to confirm your selection. can sort the information to be displayed in the report. 9. Click OK to confirm your specifications. 10. Click the Preview button to view the report. 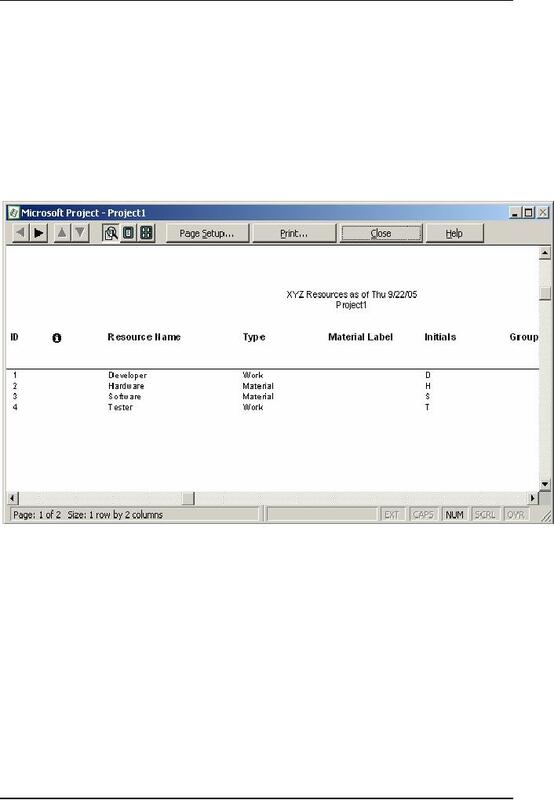 configure a printer to the computer that has Microsoft Project. displayed, you Use the Task report dialog box. box is displayed in Figure 11.24. 2. Click the Show summary tasks check box. Implementation and not the subtasks below each one of them. 3. Click the Details tab. 4. On the Details page, select the Gridlines between details check box. The Gridlines between details check box is shown selected in Figure 25. Figure 9.25: Selecting Gridlines between details Check Box. 5. Click OK to close the Task Report dialog box. You can also sort a report on different fields displayed on a report. you click the Print button to print a report. 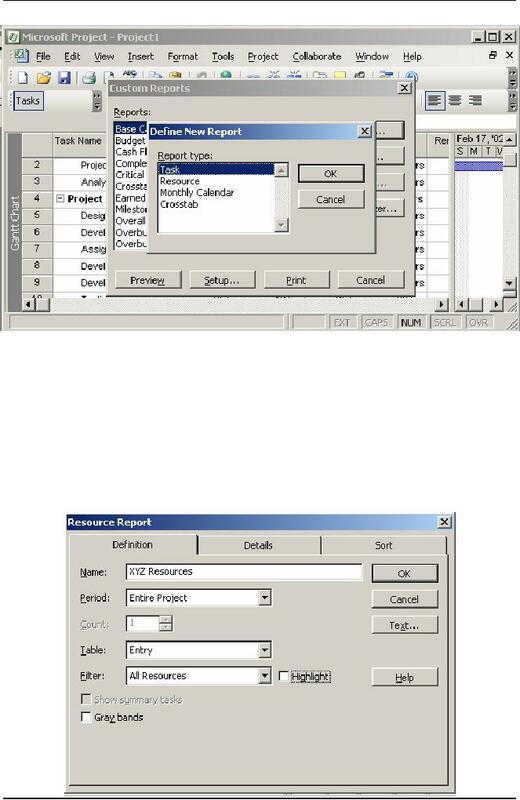 in the Custom Reports dialog box, displays the Print dialog box. Inc. complete with all the components that you have added. complete, the new system is installed and configured at the user end. handed over to the maintenance team. task is to organize a team to monitor implementation. and members of the development team. The first task of implementation is the creation of the implementation plan. 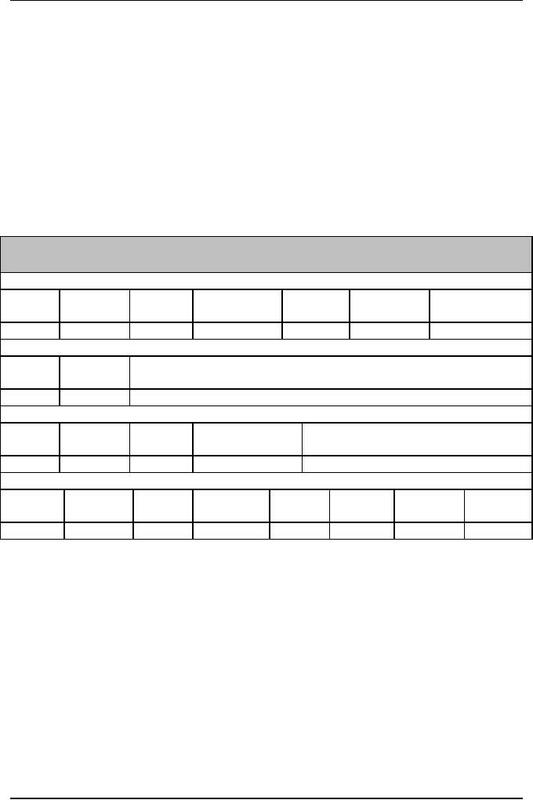 implementation plan in Table 12.1.
plan also contains data migration details. responsibilities of trainer are also included in the training plan. setting up software and hardware environment is also mentioned in the plan. acceptance criteria, list of resources, and a bug report form. agreement, the response time, and support details. earnest. Now, all the plans created for implementation are put into practice. post mortem, and product delivery. You must have heard the proverb, "the proof of the pudding lies in the eating. that the desired product design matches the actual product design. product and identifies whether it is acceptable or not. software based on the test cases. free version is delivered to the user. the system. Training for both the users and operators has separate goals. activities to familiarize them with the differences. damaged files, installing new devices and software, and making backups. operators learn to run the system, and second they learn to support the users. documentation for users and operators is updated periodically. project manager, you need to plan and monitor its progress continuously. executables are copied to the user machine. team to a great extent. At times, the project manager might need to outsource the installation activity. Then great care needs to be taken to ensure that correct versions are installed. the client accepts all documents and deliverables as mentioned in the contract. the form of an acceptance letter. activities are performed to ensure that the project ends on time. Usually a senior project manager supervises the project-wind up activities. task, unplanned tasks, and planned task that were not required are estimated. Data about software change requests and bug statistics is also noted. The performance of the project team is also evaluated at the end of the project. require maintenance activity to cater to the changes. be extra cautious while managing a maintenance project. requirements. Here, the focus is on fixing defects. a code. This change normally takes 18 percent of the maintenance time. is usually divided into three phases. acquiring the systems knowledge is also finalized. severity of the faults, application criticality, and infrastructure issues. standards and guidelines to be followed. and finalized during the initiation phase are put into practice in this phase. measures are also put in place and practiced during this phase. recommended to ensure better coordination. manager needs to ensure that no error arises during the maintenance process. maintenance, perfective maintenance, and preventive maintenance. carried out for the successful completion of the corrective maintenance process. changes. Finally, the changes are deployed based on a deployment strategy. maintenance extends the software beyond its original functional requirements. changes are implemented in the system based on the deployment strategy. maintenance process, the project coordinator identifies the potential risks. deployment happens based on the deployment strategy. The maintenance process begins when the user initiates a request for a change. Reengineering is a process of abstraction of a new system from an old system. modifications and changes. Here, the role of reengineering comes into play. Reengineering comprises reverse engineering and forward engineering. system on a different, higher level of abstraction. use reverse engineering to analyze the program at a higher level of abstraction. should be in a running condition. The latest source code should be available. modifies the draft document based on the discussions. team obtains approval from the users on the requirements. is then modified based on the new requirements. and Refine Language Tools, static analyzer, and test editor. moves from a high-level abstraction and design to a low-level implementation. Forward engineering is used to improve the overall performance of the system. Figure 12.2 displays the reengineering process. 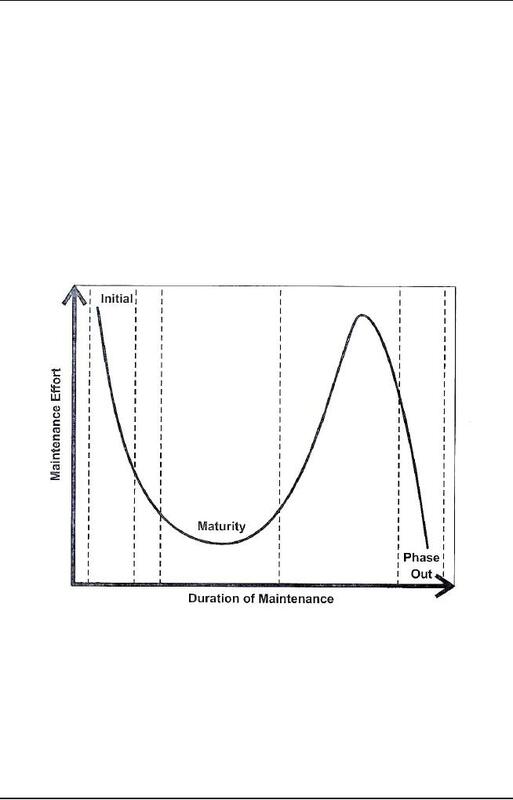 maintenance process is successful if the testing and production environment are the same. the documentation is kept up-to-date. personnel. There should be a balance between the new development and problem fixing. quality reviews and monitor the quality goals of the team.